As a wise ape robot once said, “the seeds of the future lie buried in the past.” This weekend at Botcon Hasbro revealed its upcoming Transformers releases for 2015 and early 2016, and its filled with familiar faces. If you seen the barren shelves at toy outlets across the country, then you know the Transformers Generations Combiner Wars line of toys have been a huge success for Hasbro, with collectors old and new scrambling to complete sets of robots that combine into bigger robots. So far we’ve seen updated versions of the Stunticons, Aerialbots and Protectobots (forming Menasor, Superion and Defensor respectively), as well as versions of Optimus Prime and Decepticon Cyclonus capable of taking on limbs to form bigger bots (Optimus with extra bits and Galvatronus.) Combined with the upcoming nearly two-foot tall Devastator, and you’ve got one massive wallet hit. The line hasn’t just been about combiners, however. We’ve seen old school-ish version of Megatron, Ultra Magnus and Thundercracker, as well as a tiny Legends line packed with smaller characters like Powerglide, Insecticon Bombshell and more. Looking over Hasbro’s big Botcon reveal, the trend kicks into high gear over the next year or so. Hot on the heels of the recently-released Leader-class Thundercracker, a retooling of Jetfire from the pre-Combiner Wars Generations line, we get the obligatory Starscream repaint, complete with bad comedy crown. And why stop there? All of the Decepticon seeker jets shared the same mold originally, so repaint away! I’m holding out for Thrust. With all of these official combiner groups coming together, poor Optimus Prime is running out of limb candidates, so Hasbro is releasing some classic characters that can now become arms and legs. That’s Rodimus, Prowl, Mirage, Wheeljack, Trailbreaker, Smokescreen, Prowl Hound and Sunstreaker. But wait—that’s eight limbs. Optimus only needs four. His name is Sky Reign, and he has a cat head. Last, but not least, we have a set of five war machines. 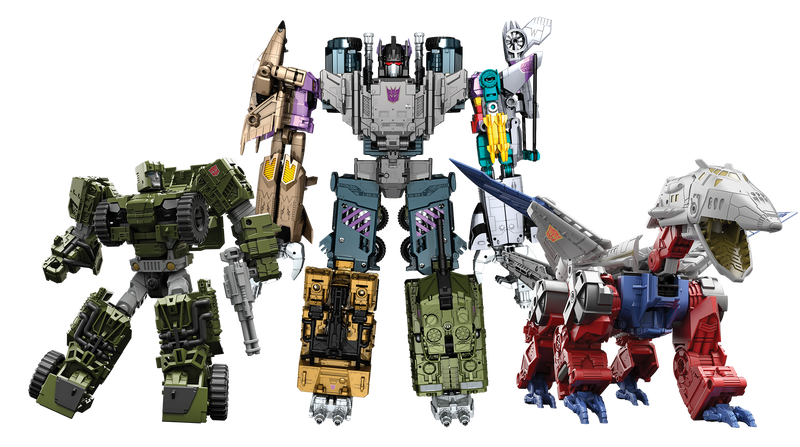 These five Combaticons combine to form the mighty Bruticus. There’s so much more. Legends class Shockwave, Wreck-Gar, Hot Rod, that one Insecticon I can never remember, plus a whole slew of toys based on the animated Robots in Disguise series. For a more comprehensive look at everything Hasbro revealed between Botcon and its Japanese showing this weekend (Masterpiece Optimus Primal! ), check in with the good folks over at Seibertron.com, my favorite place for Transformers news on the internet for more than a decade. The takeaway here is that Hasbro has really hit its stride when it comes to catering to the older Transformers fan, while if the kids need simple they can Robots in Disguise it all day long. It’s a great time to be a transforming robot lover.